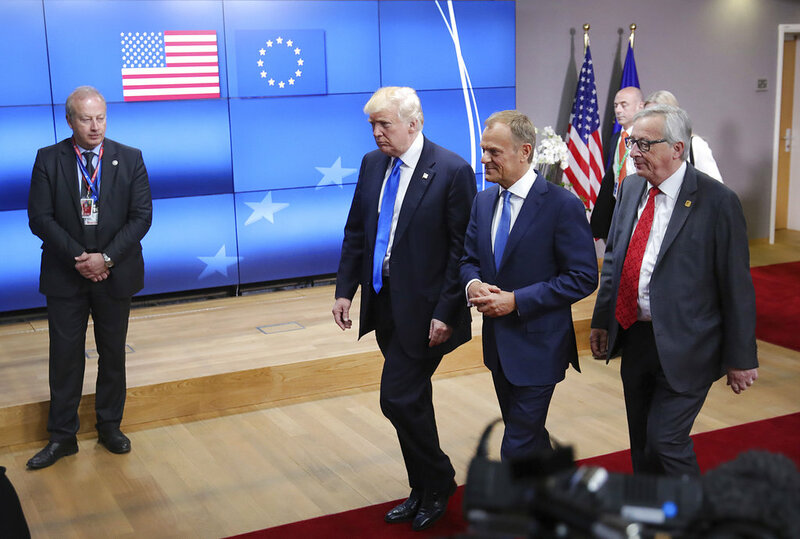 U.S. President Donald Trump speaks with European Council President Donald Tusk, second right, and European Commission President Jean-Claude Juncker in Brussels. The Trump administration announced May 31 that it will impose tariffs on steel and aluminum imports from Europe, Mexico and Canada after failing to win concessions from the American allies. WASHINGTON — The Trump administration’s announcement Thursday that it will impose tariffs on steel and aluminum imports from Europe, Mexico and Canada drew swift vows of retaliation from key allies, inflamed trade tensions and sent stock markets sinking. The administration’s move threatens to inflate prices for U.S. consumers and companies and heighten uncertainty for businesses and investors across the globe. Commerce Secretary Wilbur Ross said the tariffs — 25 percent on imported steel and 10 percent on aluminum— would take effect Friday. In imposing them, the administration is following through on a pledge to do so after having earlier granted exemptions to the affected nations to try to buy time for negotiations. The U.S. tariffs coincide with — and could complicate — the Trump administration’s separate fight over Beijing’s strong-arm tactics to overtake U.S. technological supremacy and negotiations to rewrite the North American Free Trade Agreement. President Donald Trump had announced the tariffs in March, saying they were necessary to protect the U.S. from unfair competition and thereby bolster national security. The administration has argued that foreign production of steel and aluminum has driven down prices and hurt U.S. producers, creating what the Commerce Department has called a national security threat. But in targeting its own allies, the U.S. tariffs will widen a rift with normally friendly trading partners, and the result of actions and counteractions is likely to be higher costs and reduced access to key goods and materials. 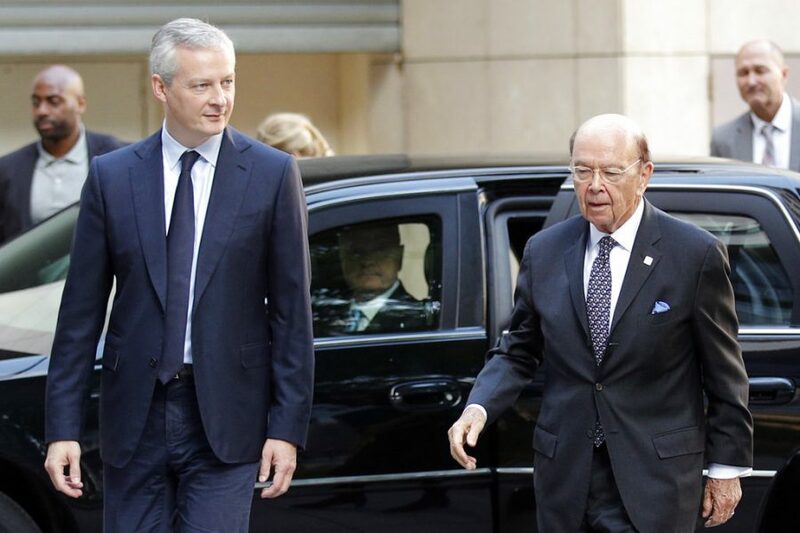 French Finance Minister Bruno Le Maire, left, welcomes U.S. Secretary of Commerce Wilbur Ross prior to their meeting at French Economy Ministry in Paris, May 31. U.S. tariffs on European steel and aluminum imports are expected after the Trump administration's failure to win concessions from EU. The European Commission’s president, Jean-Claude Juncker, said Trump’s action Thursday amounted to trade protectionism and that Europe would respond with countermeasures. He said Canada would pursue retaliatory penalties on a range of U.S. goods. Mexico said it would penalize U.S. imports including pork bellies, apples, grapes, cheeses and flat steel. Canada will impose tariffs against imports of steel, aluminum, and other products from the US – we are imposing dollar for dollar tariffs for every dollar levied against Canadians by the US. Financial markets sank on concerns about the disputes among trading partners, with the Dow Jones industrial average falling more than 200 points. The tariffs represented the latest tactic in Trump’s “America First” agenda, which has unnerved traders and investors and raised the specter of a trade war involving the U.S. and China — the world’s two largest economies — as well as other key nations. The trade actions have also opened the U.S. to criticism that it’s burning bridges just as Trump is seeking to rid North Korea of nuclear weapons and help stabilize the Middle East. “We are alienating all of our friends and partners at a time when we could really use their support,” said Wendy Cutler, a former U.S. trade negotiator who is now vice president at the Asia Society Policy Institute. Ross told reporters Thursday that talks with Canada and Mexico over revising NAFTA were “taking longer than we had hoped.” Negotiations with Europe had “made some progress” but not enough for additional exemptions, the commerce secretary said in a conference call from Paris. “We continue to be quite willing and indeed eager to have further discussions,” Ross said. He said he would travel to China on Friday for trade talks this weekend. European officials, bracing for the tariffs, have threatened to retaliate against U.S. orange juice, peanut butter, kitchenware, clothing and footwear, washing machines, textiles, whiskey, motorcycles, boats and batteries. The EU will decide exact countermeasures in coming weeks, according to the French officials. The EU said it would take action Friday through the World Trade Organization, setting in motion a process aimed at settling the dispute over the penalties. The EU move could heighten pressure on Washington. But the process typically takes many months — and in some cases, years. Brazil, Argentina and Australia have agreed to limit steel shipments to the U.S. in exchange for being spared the tariffs, the Commerce Department said. Tariffs will remain on imports from Japan. European officials argue that the tariffs, along with retaliatory actions, will hurt growth on both sides of the Atlantic. “This will only lead to the victory of those who want less growth, those who don’t think we can develop our economies across the world,” he said. Even some Trump allies in Congress said the trade moves were misguided. “Tariffs on steel and aluminum imports are a tax hike on Americans and will have damaging consequences for consumers, manufacturers and workers,” said Sen. Orrin Hatch, R-Utah. The conservative Koch brothers’ network also said it opposed the tariffs. Tariffs on steel and aluminum imports to the U.S. can help local producers of the metals by making foreign products more expensive. But they can raise costs more broadly for U.S. manufacturers that cannot source all their needs locally and have to import the materials. That hurts the companies and can lead to more expensive consumer prices, economists say. “Unilateral responses and threats over trade war will solve nothing of the serious imbalances in world trade. Nothing,” French President Emmanuel Macron said. Associated Press writers Angela Charlton and Alex Turnbull in Paris, Jill Colvin and Kevin Freking in Washington, Lorne Cook and Raf Casert in Brussels, Christopher Sherman in Mexico City, Rob Gillies in Toronto and Barry Hatton in Lisbon, Portugal, contributed to this report.